The Walking Dead Review: "Tell It to the Frogs"
Rick reunited with his family on "Tell It to the Frogs." 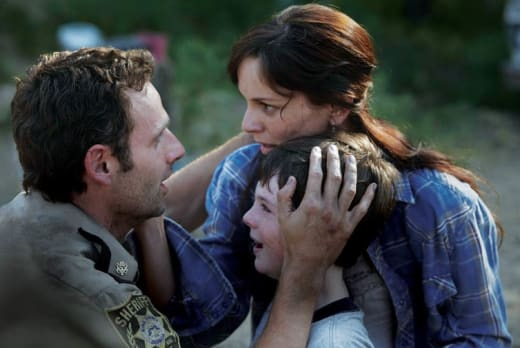 Viewers do know, of course, and that knowledge made the intimate scene between Rick and Lori a bit uncomfortable. At first, I wasn’t sure if Lori was upset because Rick came back or because she’d been sleeping with his best friend and now regretted it. I’m glad it was the latter and I believe that Lori was truly sorry and upset for sleeping with Shane. Unfortunately, as she attempted to apologize to Rick, his eagerness to make love to his wife and enjoy these moments with his wife kept her quiet. He saw the opportunity as a second chance, (remember they’d been having marital problems), and she clearly did, too. But come on, Rick, your kid is a few feet away. However, it was interesting to learn that it was Shane who told Lori that Rick was dead. That revelation made Lori a far more sympathetic character for her actions. Did Shane actually believe Rick was dead the whole time or was he simply looking for a way to get with Lori? I feel indifferent towards Shane. On the one hand, his actions with Lori make him shady, but on the other, he remains a leader and protector of the group. It’s great that he’s not a one-dimensional character. Of course, Rick also has many layers. He’s not as outspoken or lively as Shane, but he stays true to his word and is compassionate toward others. He believed that he must rescue Merle. Sure, Merle might be a racist and a degenerate, but he is still a human being. I’m glad Rick stepped up and took a leadership role, even if he’s not the one in charge. While the episode focused primarily on Rick’s interactions with the group, it also gave us a moment to see what a basic day was like for the survivors. For the most part, it looked like a simple camping trip. What’s interesting is how gender roles played a significant part in the daily activities. Women were relegated to tasks such as washing clothes, while the men focused on hunting and protection. It was like jumping back to the prehistoric times of hunter/gatherer groups. I laughed when one of the girls mentioned she missed texting. So much of our everyday lives revolve around technology that it’s hard to imagine a world without it. Even driving a sports car is a rarity. Life certainly changes when you have to focus on survival. There’s no time to check your Facebook or Twitter. What surprisingly hasn’t gone away, however, is domestic abuse. You’d think a husband would be more worried about protecting his wife from flesh eating zombies instead of spending his time hitting her. What killed me was that even after Shane stopped the husband, the wife leaped to her husband’s side and began to repeatedly apologize to him. Scenes like this are great because they show how simple human actions and beliefs can be just as powerful and dangerous as fighting off zombies. This episode was a little slower than I would have liked, but it did allow for some good character development. Maybe next week we can see Daryl Dixon do a Boondock Saints impersonation. Personally, I’d love to see more of Dale. He seems like a very interesting character that speaks his mind. Plus, I have a feeling he could be a good ally to Rick. The final moments only began to pick things but up, but I’m sure next episode will keep that pace going. Where did Merle go and is he out looking for revenge? How is Rick going to get his guns back? Will we see one of the survivors get killed by a zombie? Only three more episodes left for the season to find out!